The "Seashell" Display Home FOR SALE! Be the first to inspect this stunning, contemporary-designed Tiny Home. Perfect for all ages, simply 'plug and play' and you have a fully functional home! With a TV, fridge and air-conditioner included, all of the comforts of home are here, and absolutely nothing has been overlooked. The "Seashell" is priced to sell at just $58,000. This is a saving of over $8,000 worth of included extras! Don't hesitate to contact Simon at Tiny Homes Perth today. Not what you're looking for? That's okay, because at Tiny homes Perth we can design a Tiny Home to suit you - whatever your lifestyle or location. Call today. Welcome to the SEASHELL DISPLAY HOME! Built to suit all locations, Tiny Homes Perth in Western Australia has proudly accomplished a significant milestone in delivering it's first display home, the Seashell. Our display home is intended to showcase the quality of our materials and workmanship, as well as our potential for diversity. 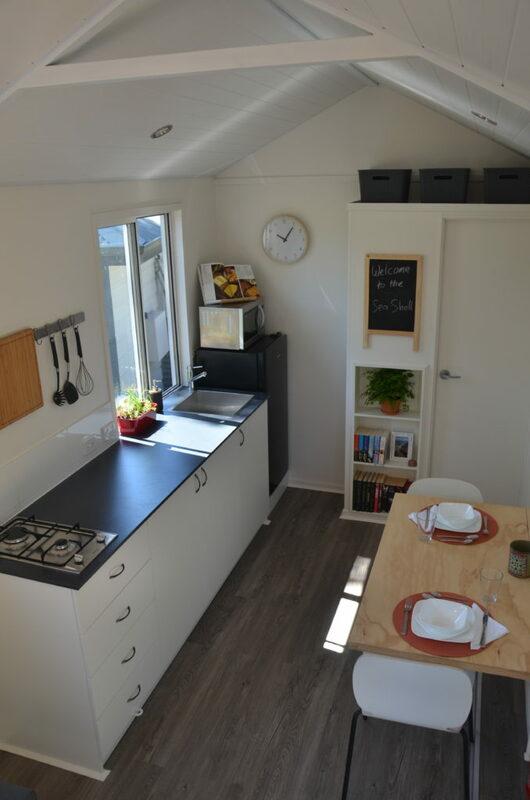 At Tiny Homes Perth we understand that "one shoe doesn't fit all", therefore our display home acts as a reference point for inspiration, demonstrating just a sample of what can be achieved. From the exterior, the Seashell is stylish and inviting. Its sleek black chassis and wheels blend in seamlessly like a shadow, and with a perimeter skirting installed (cost option) they can be made even less apparent. The cladding is contemporary, using Surfmist and Windspray Colorbond to enhance the lines and, importantly, the shadow line of the "Inspire Clad", Tiny Homes Perth's very own design of cladding. The gable roof enhances the style of the home, adding to the spacious feel. Once you step inside, you will marvel at the use of space, amplified by the sense of airiness created by the high-vaulted ceiling. The living area feels roomy and the couch can be positioned either directly facing the 42 inch TV recess, or adjacent to it for a view to outside through the sliding doors. There is cabinetry on each side of the TV recess, as well as further storage space both above it and towards the front of the home. The kitchen and dining areas are are generously sized, with the fold down dining table large enough to accommodate 2, or even 3 people without a problem - or you can use part of the table as a study desk! The possibilities are endless. The kitchen has a recess for a fridge / freezer and a microwave, and there is plenty of storage space available. A built-in bookcase allows for further storage, while the simple open-shelved nook is ideal for kitchen pantry items. Towards the rear of the home, Tiny Home Perth has provided a full-sized shower, WC and a vanity with recessed shaving cabinet to finish off the bathroom beautifully. Further storage space is available above the vanity. 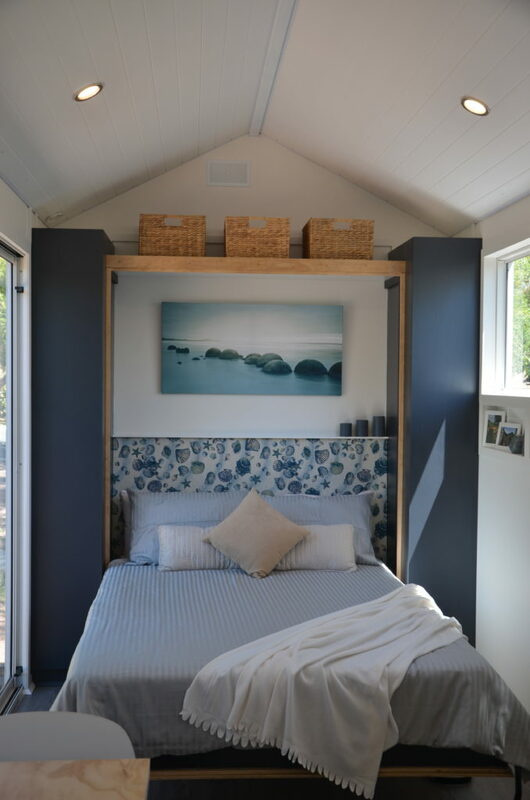 At the end of a long day there is nothing like jumping into bed, and Tiny Homes Perth have chosen the best option for your Tiny Home by installing a Murphy bed (wall bed). Simply turn the TV off, pull down the bed from above the TV, and presto - an instant, comfortable, full-sized bed! There is no need to move furniture - just pull down and jump in! At Tiny Homes Perth we can design and build a Tiny Home to suit everyone's needs. We offer a full design and construction service, allowing our clients to pursue any design ideas or finishes they wish. The integral construction of a Tiny Home is the chassis. 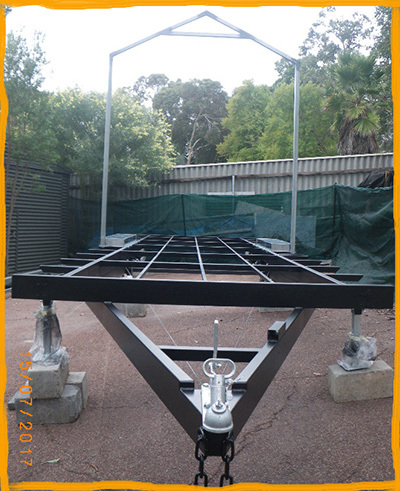 With the correct weight paramount to the proper construction of the home, the combination of sized steel members brings the home together in a strong and safe manner. 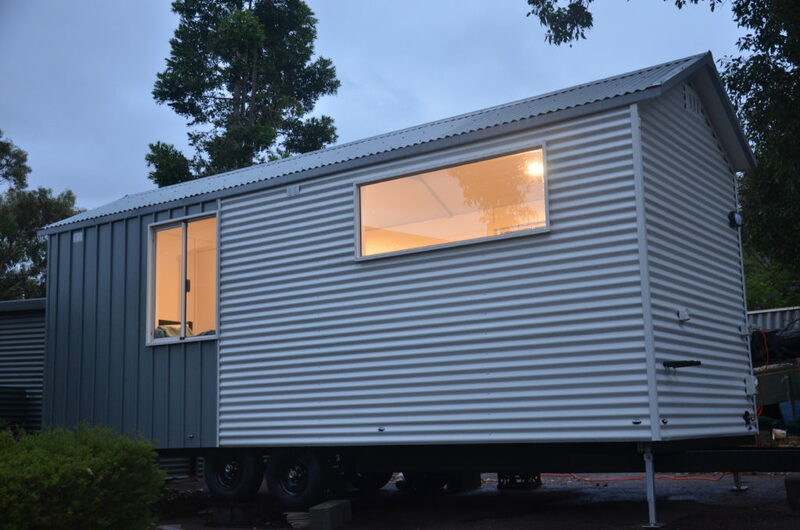 Tiny Homes Perth favours the use of pre-galvanised materials. These are sealed with black enamel, allowing the chassis trailer to blend in seamlessly with the home like a shadow, rather than making it a feature. With so many options to choose from, designing a Tiny Home can be an overwhelming task. At Tiny Homes Perth, when we began planning our first display home the ideas were endless! It was finally decided upon to build a contemporary home with clean lines, providing the opportunity to showcase just what can be done. At Tiny Homes Perth we aspire to be a little bit different. We have pushed the boundaries of Colorbond steel to create our very own, in-house designed cladding, "Inspire Clad". 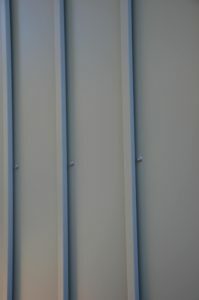 This cladding, combined with corrugated Colorbond, provides a beautiful contemporary finish to our Tiny Homes. 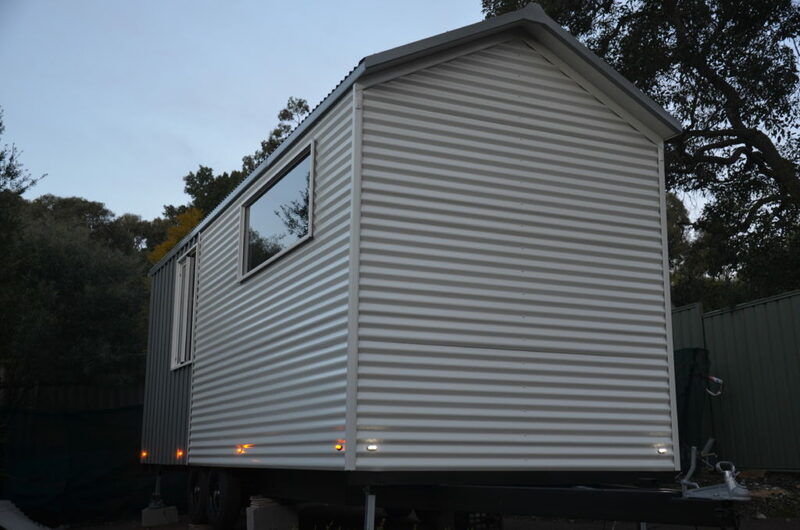 Our "Inspire Clad" can be installed vertically, horizontally or diagonally and, with a great range of resilient colours to choose from, Tiny Homes Perth, Western Australia, can design your home to suit any location. Contact Tiny Homes Perth today for a no-obligation chat.